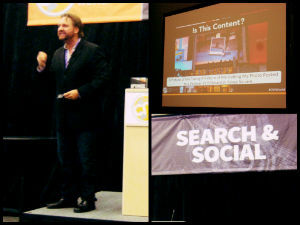 At Content Marketing World in Cleveland, Ohio – one of TopRank’s fearless leaders, Lee Odden, spoke with Content Marketers from over 40 different countries on “The Future of Search & Social” in the first breakout session of the day. 1. Content is more than information – it is storytelling that provides meaningful experiences. Setting the stage with, “Content isn’t King – it’s the Kingdom,” Lee positions content as the reason search exists in the first place. 16% of all search queries have never been seen before. Could that possibly mean that they, or (gasp) you, are potentially creating content no one cares about? Proper execution of a local and social media strategy is still a head scratcher for many internet marketers. The session on “Local + Social: the Future of Promotion” featuring Gregg Stewart and Benu Aggarwal at SES Chicago was a must see to answer several important questions. Did you know that roughly 20% of all Google searches have local intent? When you look at mobile data that number is even higher. These statistics alone should show us as marketers how important a online local strategy is for improving engagement. While website All Facebook says that 96% of small businesses are on Facebook, Mashable.com says that 64% of small businesses think that social media is unnecessary. Part of what this data tells us that many companies are simply checking the box, but aren’t sure how to properly utilize social media marketing channels. 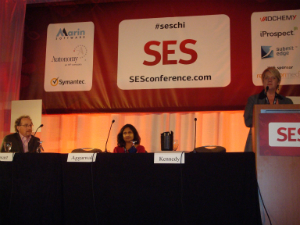 SES Chicago Session: Are You Ignoring the Power of Images? 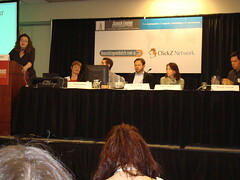 Jennifer Laycock Editor-in-Chief of Search Engine Guide helped the audience understand the value of images and 3 benefits to submitting photos to image sharing sites, like Flickr. Letâ€™s try it. What impacts you more, the description of how I dressed my dog up for Halloween OR the picture of it? Description: For Halloween, I dressed my pup up as an angel. Editor’s note: Social search isn’t the new kid on the block anymore but it still has it’s mystery as far as search marketing implications. The next in our series of guest posts comes from a very well respected guy who I’ve long appreciated as having more than an advanced understanding of where the search marketing industry is going. Ron Belanger is Vice President, Agency Development at Yahoo! and has been a strong voice on topics ranging from search as a powerful branding tool to social search and the future of the search engine industry. 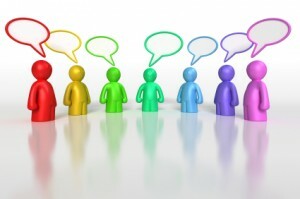 Social media is a white hot topic, getting a tremendous amount of play in the advertising world. Investors and speculators are tripping over themselves to invest in the next Facebook or MySpace. In our continuing coverage of the Search Engine Strategies conference in San Jose, we’re shooting periodic video interviews both in the speaker ready room and a few on the exhibit floor. In this interview Steven Marder of Eurekster talks about how their Swicki product works both for online publishers to attract and monetize traffic as well as serve as a useful web site marketing tool for SEO efforts. “Video is a compelling SEO channel,” said Sherwood Stranieri of Catalyst Online, “and social marketing and viral marketing are the driving forces behind video optimization.” We’re witnessing, with Google Universal, how digital assets are changing the landscape of search. Video, like audio files can drive unprecedented traffic as well result in a surge of inbound links. This is great- if you have entertaining video content, right? Wrong! It may seem at first glance, that video optimization makes sense for very particular industries and not others, but this is not the case. Although video optimization is an almost ideal search marketing tactic for individuals belonging to generation “Y”, it is not limited to this demographic. Human beings are interactive and become more engaged when stimulated. Video content plays to our visual and audio senses. One of the key components of the presentation I gave this morning at the Las Vegas Pubcon conference presented the idea of press release optimization and social media news releases in the context of push and pull. But before that, it’s important to understand the market opportunity with news search. According to a report released by comScore, half of all internet users visited news sites in June 2006. Of the most popular news web sites, Yahoo News is #1 surpassing CNN, MSNBC and AOL News. There’s also an increase in the use of social media both by end consumers and the media for tracking information that interests them. 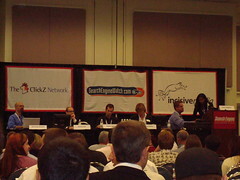 This includes: blog and news search engines, social news, social bookmarks, podcasts and video. The thing that ties all of this together is RSS. RSS enables people to subscribe to the kinds of content from the channels or formats that they are interested in.